To encrypt data in backups and files, Veeam Backup & Replication employs a symmetric key encryption algorithm. The symmetric, or single-key encryption algorithm, uses a single, common secret key to encrypt and decrypt data. Before data is sent to target side, it is encoded with a secret key. To restore encrypted data, you must have the same secret key. Users who do not have the secret key cannot decrypt data and get access to it. 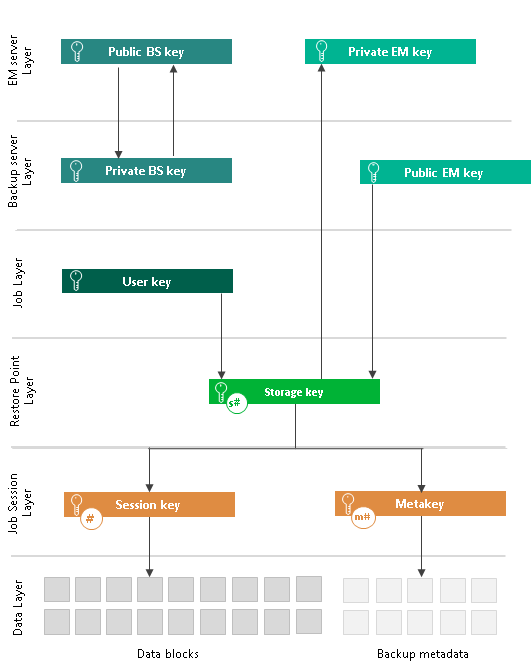 Veeam Backup & Replication relies on a hierarchical encryption scheme. Each layer in the hierarchy encrypts the layer below with a key of specific type.